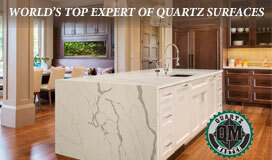 Extend the joy of holiday entertaining into the new year with a small midwinter dinner party. The table is set with dinnerware and stemware by Vera Wang for Wedgwood. Photo Courtesy of Wedgwood. 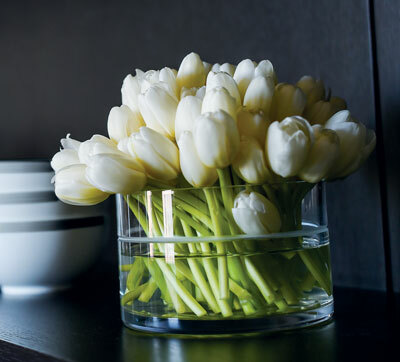 A simple arrangement of tulips fills the Vera Bande bowl ($70 for 6 inch, $90 for 8.5 ince). Photo Courtesy of Wedgwood. Distinctive but simple bands accent the Vera Bande stemware. Goblets, wine glasses, flutes and tumblers are each $50 per pair. Photo Courtesy of Wedgwood. The gold and gray bands of Vera Castillon dinnerware appear to add subtle movement. A four-piece setting is $100. Photo Courtesy of Wedgwood. 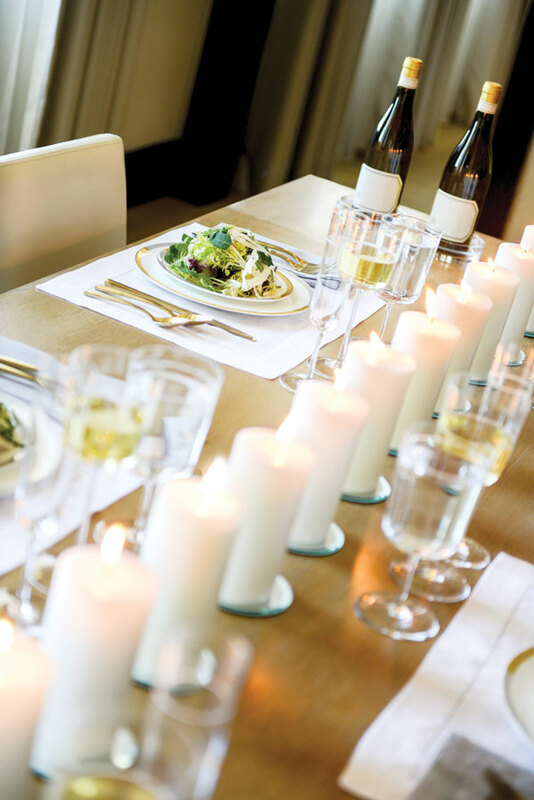 Lift your spirits with a simple yet elegant dinner party. If you can’t stand even one more evening of early sunsets and chilling temperatures, gather your friends for a meal served in the light and warmth of your dining room (remember the room most people use only on holidays?). Celebrate the middle of winter, the coming spring (March 20) or, better yet, the friendship that brings the group together. Regardless of the food you choose—be it simple or elaborate—serve it on elegant dishes and add floral accents (perhaps a low vase of white tulips) and white candles (who doesn’t look good in candlelight?). You might just revive the tradition of dinner parties. Vera Castillon dinnerware by Vera Wang for Wedgwood is a perfect complement to a midwinter dinner gathering. 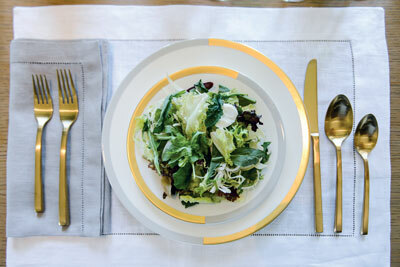 The distinctive, understated design offers modern attitude with simple bands of gold and gray in an asymmetrical offset that subtly shifts with each piece (place the dinner plate with the gold on the right, the salad plate with the gold on the left, the soup bowl with the gold on the right, etc.). 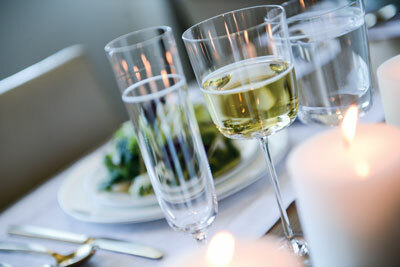 Vera Bande stemware continues the modernist ethos with an elegant shape and simple band accent. Flower bowls, decanters and vases are also available. Completing the look is the company’s polished gold flatware, interpreting an emerging trend toward yellow metals in all types of home furnishings and accessories. It’s possible you could even start to look forward to winter!